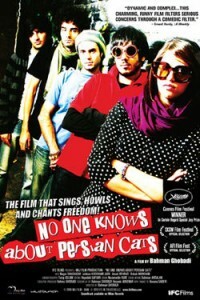 Bahman Ghobadi’s film, No One Knows About Persian Cats, opens in Seattle at the Varsity this Friday, April 30th. While not a documentary, the film is based on real events, and all of you concerned about free speech in the world and especially in modern Iran should check it out. It sounds interesting and the musicians who were imprisoned in Iran are on the soundtrack. As a side note about cats in Islam (because initially I thought this film actually was about cats), the prophet Muhammad was very fond of his cat, Muezza. Written by: Dagmar on 04/26/2010. This entry was tagged films, movies, no one knows about persian cats, posted by dagmar. Bookmark the permalink.